It’s about time you upgraded your heroic gear with a battle ready shield! This authentically decorated replicas are steel plated to give aspiring princess rescuers that much needed defense when taking on enemies across Hyrule. 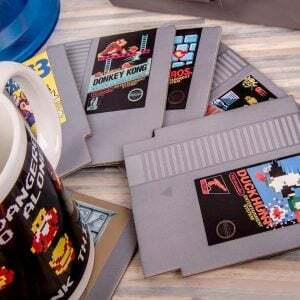 Perfect for the retro gamer with space issues! Each bench is handmade to resemble Tetris blocks and comes with plenty of storage space inside for all your things. Just don’t arrange them in a horizontal line or they may disappear! This hat comes just as silly as the Pokemon! Have the most useless splashing fish crocheted and stitched up to be made into a very wearable hat to beat those chilly winters. It’s really about all Magikarp is good for until he evolves. Send your entire Pokemon collection to shame when you proudly display this epic Rapidash figure! With a height of 18cm to the tip of the horn, this custom made figurine made of light and pleasant of touching material. This stunning Vulpix plush looks as though it’s the real thing! Custom made and amazingly lifelike, this fully posable replica will become the centerpiece of your plush toy collection. You can also commission another Pokemon made just for you!